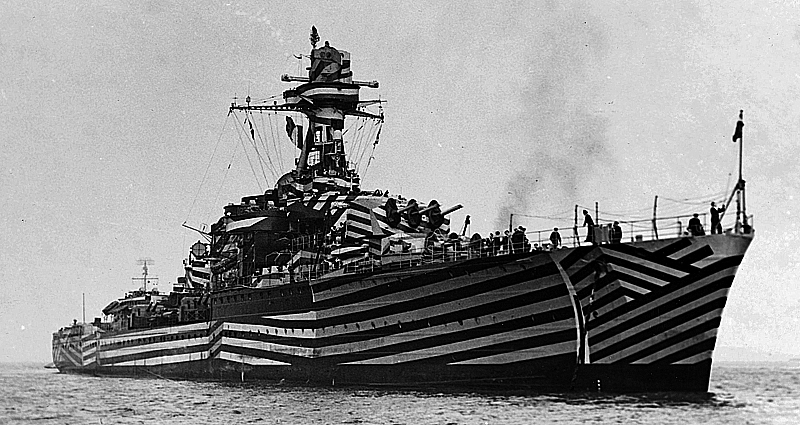 Cruiser La Gloire in April 1944, probably during a naval exercise, filmed by US news in the Mediterranean, showing her amazing and world famous dazzle camouflage. This “adaptor scheme” was originally developed for PT boats. The livery was nicknamed by her crew the “railway accident” livery. 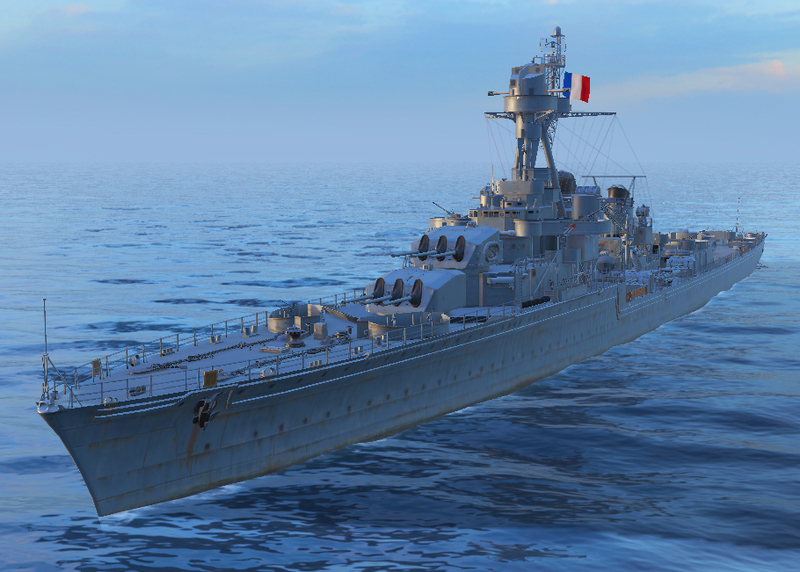 The best French light cruisers? The La Galissonière class (good luck pronouncing that!) was the last of this type (the next class, De Grasse, was laid down in 1939, way too late to be completed). Arguably the latter completed post-war after many modifications were on heavy cruiser side, at 12,350 t (12,155 long tons) fully loaded. 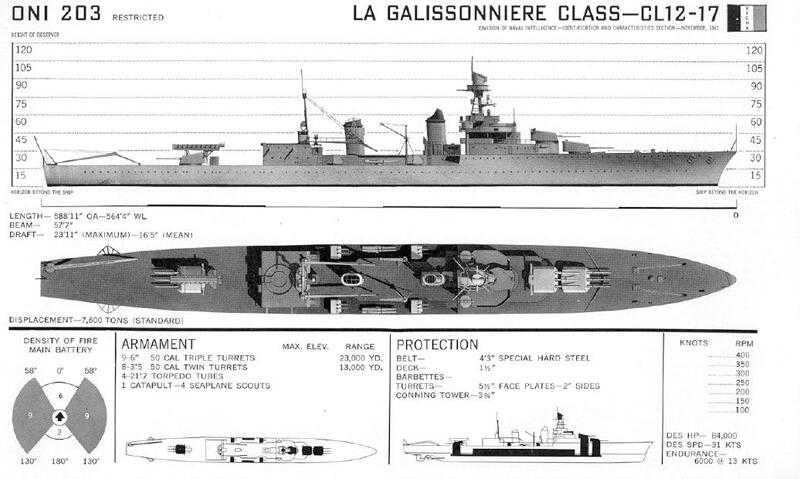 The 1930s La Galissonnière were “serial” cruisers derived from the 1933 Bertin that acted as a prototype for the new triple-turrets that were very much in favor in all navies in the 1930s. They all had long and significant careers during and after WW2. 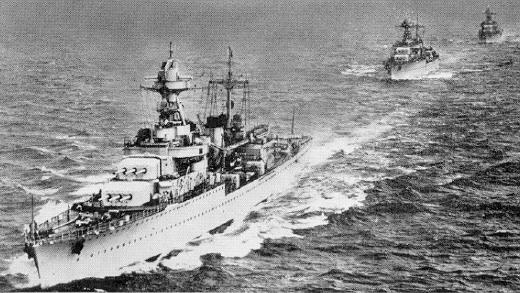 In the 1930s the only light cruisers in service -outside the Primauguet class– has been the war reparation Thionville, Colmar, Mulhouse, Strasbourg and Metz, former Austro-Hungarian and German cruisers. They were modern cruisers whereas French cruisers during ww1 has been largely obsolete and wartime construction stopped completely during the conflict and allowed to study modern foreign designs. At the same time, the 1930 London Naval Treaty precise a distinction between Type A cruisers (with guns from 155 to 203 mm) and Type B with less than 155 mm caliber. But this caliber was precisely adopted by the French on their Primauguet class. 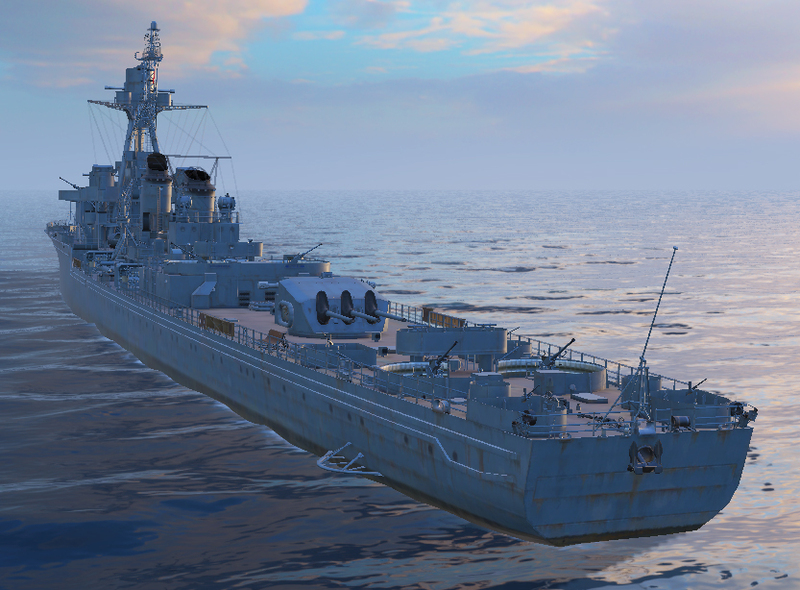 So to comply with the allocations of units per nation, France on the new Emile Bertin had to design a minelayer/destroyer flotilla leader armed with 152 mm guns, which also allowed to fit them more easily in triple turrets and fill the allocations in light cruisers. The Bertin not only innovated with its triple turret design -as far as France was concerned- but also with her secondary artillery with dual purpose twin and single 90 mm mounts, which appeared unable to cope with the speed of modern monoplanes after 1937. However, with 39.66 knots (73.45 km/h) on speed trials, Bertin blasted all records and became the fastest French cruiser ever built. Gloire in December 1944, apparently with the standard two-tone pattern of the time, Measure 22 graded system also used by Montcalm. She had during her lifetime tested five different liveries. The Bertin design was therefore considered as a trusted basis for the new design, as well as the armor scheme already given to the Algérie, which was considered the best of its class. The la Galissonière was however intended to answer the Italian Condotierri class. 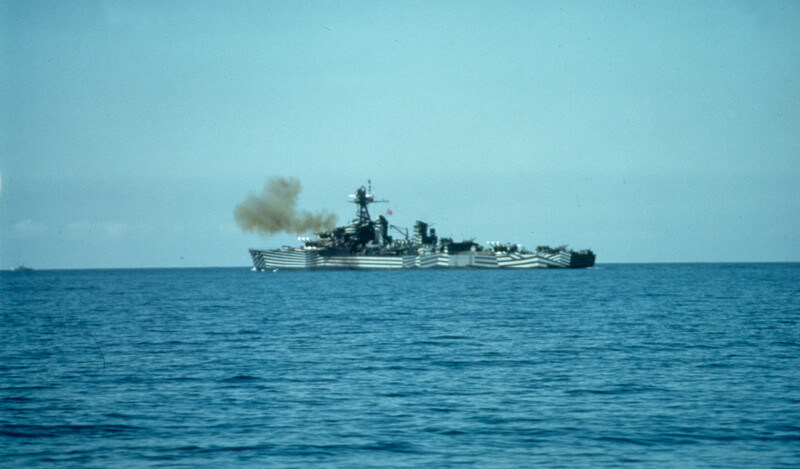 the La Galissonnière displayed nine 6-in guns (152 mm) in triple turrets, for medium range saturation fire. They were marked by more compact superstructures, a square stern, a stronger hull, and reinforced protection. In the end, they were heavier than 1000 tons compared to the Bertin, which was not negligible for their size. No fewer than six ships were ordered, which entered service between 1935 and 1937. These ships were compromises, designed to ensure both good speed, impressive weaponry, and adequate protection. These ships were, all things considered, among the most beautiful and capable cruisers of the fleet in 1939, on part with Algérie for heavy cruisers. Their long post-war career bears witness to this. In the end, apart from their secondary AA still too weak in 1939, the La Galissonnière were judged, in France and abroad, as rather successful light cruisers, although light for the new standard of the day. Their square stern was an innovation, already tested by the Germans and which became popular postwar. But the La Galissonière was not the last French light cruiser design. According to the new fad of 1935 started by the Japanese and followed by UK and virtually all other nations, a new type of “light-heavy” cruiser was preferred: Entirely armed with “light” 6-in guns but with the displacement of heavy cruisers, 10,000 tons and beyond. This design was intended to provide “saturation” fire with one more triple turret (so 12 guns total), and the French quickly followed suit with the De Grasse, Guichen and Chateaurenault of a new design. 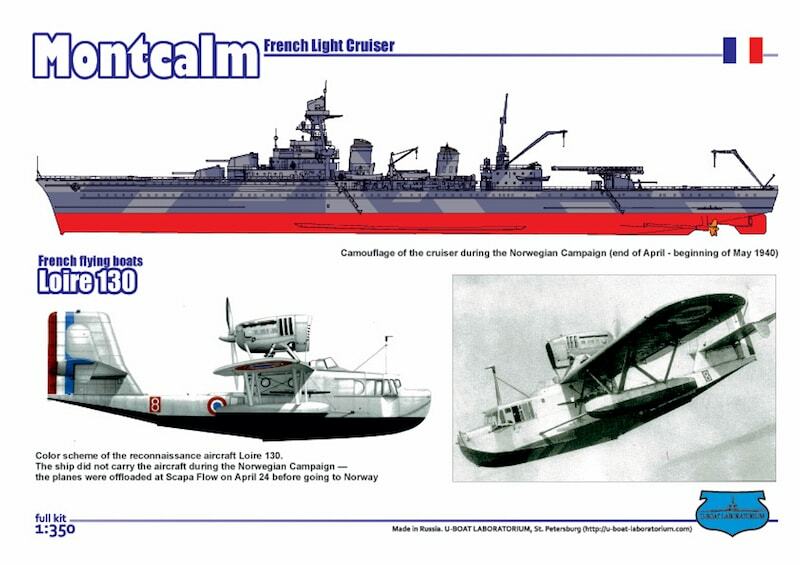 They would have the same dual-purpose 90 mm guns and three to four floatplanes, combining if needed Loire 130 and Latécoères 298 torpedo floatplanes. Started in November 1938, De Grasse construction was not advanced enough to allow a premature launching and completion in French Colonies. The Germans did not intend to complete here either, and she was launched in 1946, then taking in hands for a complete rebuilding and modernization as fleet AA cruiser. Main artillery: The concentration of triple turrets gave the new class an advantage of one gun compared to the older Italian Condottieri III Group, and used a unique caliber proper to this class and Bertin, the 152 mm/55 Model 1930. The turret mount M1930 weighted 169.3 tons. Rate of fire for each gun was 12 seconds between each round or 5 rounds per mn. This was equivalent to less than the equivalent Italian 5-8 rpm, but with a slightly better range, of 26,147 meters (28,595 yd) at 45°, versus 22.6 kilometres (14.0 mi) at +45°, slightly better same muzzle velocity (therefore penetration power) of 850 m/s (2,800 ft/s) versus 870 meters per second (2,900 ft/s). They received four 90 mm twin mounts (3.5 in/50) model 1926, probably the best AAA in the whole French arsenal at that time (12 to 15 rounds/minute shell up to 15 000 meters). These were of the fixed QF ammunition type, firing a 90 x 674mm shell, weighing 9.51 kg (21.0 lb). The mount provided used a Schneider semi-automatic breech mechanism breech with -10° to +80° elevation and -150° to +150° traverse and 850 m/s (2,800 ft/s). Maximum firing range in horizontal plan was 16,885 m (18,466 yd) at 45° and ceiling was 10,600 m (11,600 yd) at 80°. The model was most efficient against low-flying bombers and the Germans captured and reused many land-base types called 90mm CA, as 9 cm Flak M.39(f). AA artillery: It comprised four twin 37 mm guns. These were true AA caliber, quick and hard-hitting enough to have the job done against fast, modern monoplanes. But few in numbers. This was completed by twelve 12.7 mm heavy machine-guns which were proved totally useless in 1940. In 1941 all ships received a complement of 1 x 37 mm, 2 x 25 mm and 4 x 13,2 mm AA. But that was still not enough to 1942 standards. However the surviving Dakar ships sent to the USA in late 1942 (Georges Leygues, Montcalm, and Gloire) would receive 24 Bofors 40mm (2-pdr)L/60 in six quadruple mounts and twenty 20 mm Oerlikon guns. To avoid the management of AA artillery to be a nightmare with five different calibers, older AA artillery was removed as well as the turret catapult and aft hangar and aviation to clear a nice AA arc of fire. However the elimination of aviation was not compensated by the adoption of radars apparently. These cruisers had also impressive onboard aviation: Four LGL 832 seaplanes quickly replaced by two Loire 130, housed in a hangar located in front of the aft turret. The latter had a roof-mounted catapult to facilitate launching. The gooseneck crane at the base of the aft mast was used to retrieve these and also to manage the yowls and boats. These facilities and the large Loire 130 made them well suited for long-range reconnaissance. The ideal combination was two Loire and two Latécoère 298, the latter able to strike enemy destroyers. Their 550 mm model 23DT torpedoes were effective, with a larger offensive payload as the usual 21-in models, 310 kg of TNT. They weighed 2070 kg, measured 8.30 m and were capable of hitting a target at 9000 meters, at 39 knots. The armor was still relatively light and to compensate, heavily compartmentalized, but the overall thickness theoretically allowed them to withstand shells from cruisers of the same rank armed with 6-in guns (152 mm). In detail, this comprised a main belt 105 mm (4.1 in) in thickness, bulkheads ends of 30 mm (1.2 in) and 120 mm (4.7 in) sides, 38 mm (1.5 in) decks, 100 mm (3.9 in) turrets and 95 mm (3.7 in) conning tower. Underwater compartmentation allowed in theory a torpedo hit damage to be contained. Their propulsion varied according to the units, between Parsons turbines (La Galissonnière, Georges Leygues, Montcalm) and Rateau-Bretagne (Gloire, Marseillaise, Jean de Vienne). Their nominal top speed was 31 knots, but some like the Marseillaise managed to maintain a speed of more than 35 knots. There were two shaft geared turbines fed by 4 Indret boilers, for a total of 84,000 shp (63 MW). The nominal top speed of 31 knots (57 km/h) was as designed. Range was 7,000 nmi (13,000 km) at 12 knots (22 km/h), enough for the Mediterranean. All in all, these cruisers were comparable to the Nürnberg/Leipzig, Italian Montecuccoli and Crown Colony class. Gloire, from a USN movie, possibly during an exercise in April 1944. La Galissonnière, Jean de Vienne and Marseillaise formed the 3rd division of cruisers in 1939, based in Bizerte for the Mediterranean, and the other three, the 4th division based in Brest for the Atlantic. The 4th Division was attached to the raid force in 1939, along with Strasbourg, Dunkerque, heavy cruisers and destroyers at Brest which protected convoys from the Atlantic routes and hunted German corsairs. After the fall of France, both divisions experienced all the turmoils of occupation and divided loyalties. The 3rd Cruiser Division was based in Toulon until the scuttling of late 1942, and their operational sorties were almost impossible due to the lack of fuel whereas ships of the 4th division joined the FNFL (Free French Naval Forces) and fought on until 1945. Gloire, Montcalm and Georges Leygues participated indeed in the Italian campaign, the landing in Normandy (Overlord) and Provence (Anvil-dragoon). After the war, the cruisers served in Indochina. After returning in the Mediterranean they were assigned to Toulon, re-equipped for a second time with more modern AA artillery and new radars. They were maintained in service until 1958 (Gloire), 1959 (G. Leygues), and even 1970 (Montcalm). The admiralty briefly considered the conversion of the latter into a missile cruiser. But the light tonnage and frail construction left few options. And her hull after 40 years of service, had its fair share of stresses. The lead ship of the class (launched, completed ) bears the name of a famous French admiral Roland-Michel Barrin de La Galissonière, 18th-century governor of new France and winner of the battle of Minorca. The cruiser served with the 3rd Cruiser Division at Toulon. She first patrolled the Tunisian coast but was refitted in Brest and returned to Toulon. Ordered to Mers-El Kebir too late in August 1940, she stayed in Toulon afterwards deprived of fuel. Her only sortie was in November 1940, escorting to Toulon the battered battleship Provence, from July 1940’s Operation Catapult. Disarmed and inactive she was scuttled (Operation Lila) to prevent her captured by German troops on 27 November 1942. Two of these ships were given to the Italians, renamed FR11 and FR12, but the salvage and repairs failed and were eventually canceled. They were sunk by Allied raids in 1944 during the landing in Provence (Anvil Dragoon). She started with the 3rd Cruisers Division based in Bizerte, and was undergoing a refit at Toulon when the war broke out. She escorted Dunkerque while she sailed to Halifax, Nova Scotia in December 1939 with French gold reserves, and after the declaration of war from Italy she hunted down the Italian submarine Dandolo. She was at Algiers at the time of the armistice and received in July 1940 the message from the French Admiralty to join Mers-El-Kebir to sail from Algiers at once. The message was sent in clear and was intercepted by the Brtish admiralty who urged Sommerville to speed up the negotiations and ultimatum. But the three cruisers were en route when the shelling began and later received a message to sail to Toulon instead. Part of Vichy’s French High Seas Force, Jean de Vienne left idel because of the lack of fuel until late 1942. Her only sortie, in January, was to save survivors of liner Lamoriciere off the Baleares. When scuttling orders were given on 27 November, Jean de Vienne was in drydock. However her captain had her moved forward to obstruct the gates, valves opened and equipment smashed, whereas German commandos found and disarmed the demolition charges. So she also rendered the gates useless. She was given later to the Italians as FR.11 and raised on 18 February 1943. But work progressed slowly and was 85% complete at the time of the Armistice of Cassibile. She lay there until 24 November 1943, when she was bombed by USN aviation and recaptured during operation Anvil Dragoon and scrapped afterwards. Marseillaise joined the French Mediterranean Squadron in 1938 as flagship, flying the colors of Contre-Amiral Decoux. In January 1939 she was part of the 3rd Cruiser Division based in Casablanca. In September she was at Toulon as flagship of the 4th Squadron (Force Z). She escorted Dunkerque carrying the French gold reserves in Canada in April 1940 and sent to Bizerte as part of the Force de Raid, if Italy was to enter the war. She was in Toulon in July 1940 and after the British attack on Mers-el-Kebir she was authorized by the Germans to be kept ready as part of the Vichy High Seas force. Nevertheless, because of the lack of fuel she stayed inactive until her scuttling, sabotaged and set on fire on 27 November 1942. For the anecdote, German commandos arrived at the gangplank when the ship was just started sinking with valves opened to one side only. They were refused permission to board the ship but did not open fire either in their exposed position and just waited for the ship to capsize. Later on the cruiser was blown apart by explosive charge after the crew evacuated while officers were taken prisoner. The ship burned for seven days and her state was so sever she was never considered to be given to the Italians. Marseillaise was scrapped in 1946. Georges Leygues started her career in brest, in Britanny, NW France. She soon joined the Atlantic Force de Raid patrolling the Atlantic and shelled by error the French submarine Casabianca. She then joined Mers-el-Kebir (Oran) on 24 April 1940 but was in toulon when the british attack took place (Operation Catapult). With her sister-ships Gloire and Montcalm she sailed through Gibraltar and refuelled at Casablanca to join Libreville, Gabon, and then Dakar. She fought the combined allied force sent there in September 1940. She duelled with HMAS Australia and dodged several Fleet Air Arm attacks. After joining Casablanca in August 1941 she swapped sides on orders to the allies after the defection of Admiral Darlan late 1942. In April 1943 operating from Dakar she caught in the Atlantic the German blockade runner Portland. She was sent later for a refit at Philadelphia Naval Shipyard, renamed there by the Royal Navy and USN personal “George’s Legs”. She was refitted with modern USN standard AA and equipments from July to October 1943. She then returned to Dakar, and later covered the Allied landings in Normandy in June 1944 and on the French rivieria in August. Her last action was to shell a pocket of resistance near Genoa by March 1945. Refitted at Casablanca she served in Indochina, and later during the Suez Crisis, shelling positions in front of the Israeli advance in the Gaza Strip. She was decommissioned in 1957 and paid off in 1958. After trials was based in Brest in November 1937. But she left for French Indochina in December, and was back in April 1938 with the 4th Cruiser Division. She then toured Britain and the United States in 1939 and refitted in October-December 1939. She escorted Dunkerque with French gold reserves to Canada, and back with a Canadian troop convoy. She patrolled the Atlantic with Gensoul’s Force de Raid. Anchored at Algiers in June 1940, she was urged to leave for Toulon to join in July the new Vichy French Independent Naval Force. Gloire was called to rally in emeregency Mers-El-Kebir but missed the engagement. However soon African colonies were falling to the Free French and both cruisers received an authorization from the axis naval commission to rally Libreville (Gabon). The three ships passed through Gibraltar unchallenged but Gloire developed engine problems and was left behind. She was soon caught by HMAS Australia and HMS Cumberland and escorted back to Casablanca, missing the fight at Dakar. Refitted on 12 September 1942, she saved passengers from Laconia, and after Operation Torch, swapped sides on orders from the commander in chief, admiral Darlan. She would join later Philadelphia from February 1943 for a comprehensive refit including AA armament. She was given six 40 mm quadruple mounts (24) and twenty single 20 mm Oerlikon. Aircraft equipment was removed as well as the hangar, boats, masts and cranes. There is controversy about her famous camouflage and when it was applied. 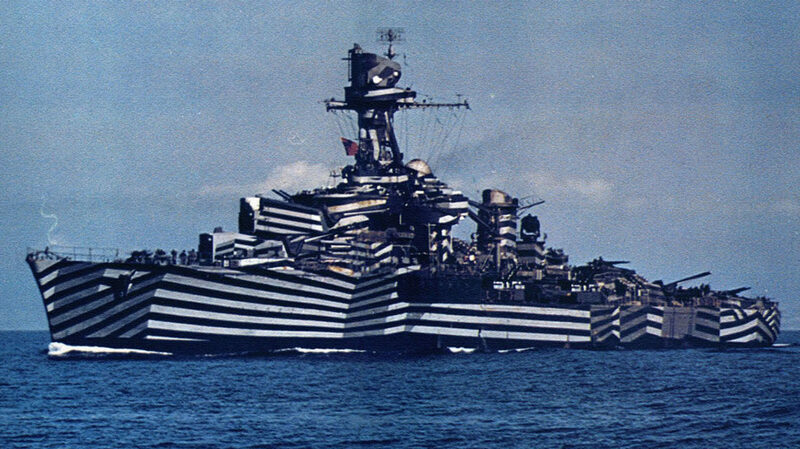 She was indeed taken in photo with a more conventional french 1940 type pattern in the summer of 1943, was seen with her new razzle dazzle livery in the Mediterranean and Italian campaign. Indeed she operated from Dakar, teaming with Italian cruisers to hunt Axis blockade runners in the south Atlantic. By January 1944, she covered the Allied landings at Anzio, shelling positions from the Bay of Gaete and carrying reinforcements to Italy and Corsica. Refitted agains in Algiers (27 April-17 June) she covered Operation Dragoon in August (Landings in Provence) and supported Allied forces along the Riviera, before returning to NY (where the photo was taken) in 1945. After WW2, she operated in Indochina, was paid off in 1955 and sold in 1958. Montcalm replaced Bertin in Norway, to cover the French troops engaged around Namsos (Campaign of Norway). Then in April 1940, with the bellicose attitude of Italy, it was decided to send the 4th division in the Mediterranean, the ships being based in Algiers. In June, they made two trips to try – in vain – to intercept Italian cruisers on their way back from a raid. The 3rd and 4th Divisions received an order from the Admiralty in August 1940 ordering them to reinforce at once Mers-El-Kebir force. This order was intercepted by the Royal Navy and Admiral Somerville’s squadron, while negotiations were taking place with Admiral Gensoul, forcing him to abbreviate discussions. The six cruisers arrived too late to take part in what would have been probably a Franco-British naval battle of a certain magnitude. Learning of the one-sided shelling and tragedy, they were ordered to sail back to Toulon. Montcalm off the Philadelphia Navy Yard, Pennsylvania, 30 July 1943. She had just finished a refit at that Yard. In September 1940, the Vichy government asked the Admiralty to strengthen Libreville (Gabon) where an attack of free France was envisaged. The 4th division was sent on the spot. But in the meantime they learned that the oil tanker Tarn, escorted from the Primauguet, was intercepted and forced to turn around by the Royal Navy, and so they were forced to divert themselves and set sail for Dakar, without Gloire, slowed down by turbines and forced by the Royal Navy to return to Casablanca. Montcalm took part in the successful defense of the Vichy fleet against the combined Allied forces (Operation Menace), along with Georges Leygues. In June 1941, Gloire joined them. The cruisers remained anchored at Dakar until 1943, but Gloire already left in September 1942 to try to save victims of the steamer Laconia, sunk by U156. Jean de Vienne did the same later with the Moricière off Baleares. Whereas the 3rd division, after almost two years of inaction was scuttled at Toulon, cruisers of the 4th Division survived. Remaining at Dakar, as the latter swapped sides, they joined the allies. Before taking part in new operations, they were sent for rearming and refitting to US standards in Philadelphia and New York naval yards. They emerged with modern artillery, radars, and new camouflages. The cruiser Montcalm in 1944 (1/400th). Note the typical two-tone camouflage of the US Navy standard between mid-1944 and early 1945. Dimensions: 179 m long, 17.5 m wide, 5.35 m draft. Propulsion: 2 propellers, 4 Parsons/Rateau-Bretagne turbines, 4 Indret boilers, 84,000 hp. Maximum operational speed 31 knots. Armour: 105 mm belt, 120 mm anti-torpedo partitions, 38 bridges, 100 mm turrets, 95 mm blockhaus. Armament: 9 pieces of 152 mm cal.55 (3×3 – 1930 model), 8×90 mm AA (4×2), 8x37mm AA (4×2), 8×13,2 mm AA (4×2), 4 TLT 550 mm (4×2), 2 seaplanes Loire 130. Nothing from Neptun (http://www.navis-neptun.de/produkte/preislisten/preisliste.pdf), Armo models, AJM Models or the French historical modeller Heller. There is also a 1/400 paper model by Mikroflota. EDIT 14/11/2018: Update done !